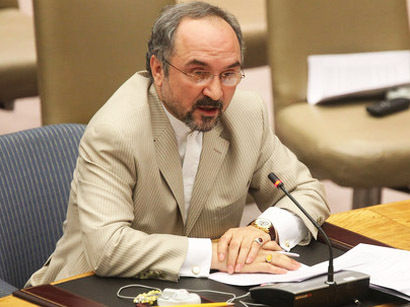 United States of America should remove pressures and prove its honesty as a prelude to possible direct talks between the two countries, Iran's Permanent Representative to the United Nations Mohammad Khazaei said on Sunday, IRNA reported. He made the remarks in an interview with CNN's GPS program hosted by Fareed Zakaria. Criticizing Argo movie's insult to the Iranian nation, the envoy called on the film's director to apologize from the Iranian nation. 'Iran welcomes negotiations with any country based on mutual respect,' Khazayee said. He called recognition of Iranian nation's rights, including the right for peaceful use of nuclear energy, as a prelude to any kind of talks with Washington adding that US officials should prove that they have good will in their allegations concerning holding talks with Tehran. Khazayee added that threats against his country won't help the negotiations between Iran and Group 5+1 (the five permanent UN Security Council members plus Germany. 'Threatening Iran is not going to work,' the Iranian ambassador noted. Iran and six world powers last week agreed on further meetings after two days of talks in Almaty, Kazakhstan, the first since negotiations broke down in June, 2012. On CNN, Khazayee repeated the Iranian view that the Almaty talks were a 'turning point' with the G5+1. Technical talks are scheduled to be held in Istanbul on March 18, and political discussions with international negotiators will resume in Almaty, Kazakhstan, on April 5-6, according to Iran's top negotiator Saeed Jalili. Despite the rules enshrined in the Non-Proliferation Treaty (NPT) entitling every member state, including Iran, to the right of uranium enrichment, Tehran is now under four rounds of UN Security Council sanctions and western embargos for turning down West's calls to give up its right of uranium enrichment. The Islamic Republic says that it considers its nuclear case closed as it has come clean of International Atomic Energy Agency (IAEA)'s questions and suspicions about its past nuclear activities. Political observers believe that the United States has remained at loggerheads with Iran mainly over the independent and home-grown nature of Tehran's nuclear technology, which gives the Islamic Republic the potential to turn into a world power and a role model for the other third-world countries. Washington has laid much pressure on Iran to make it give up the most sensitive and advanced part of the technology, which is uranium enrichment, a process used for producing nuclear fuel for power plants.